Taoiseach Leo Varadkar is "so far" satisfied with Communications Minister Denis Naughten's position after claims the National Broadband Plan contract has been "contaminated". 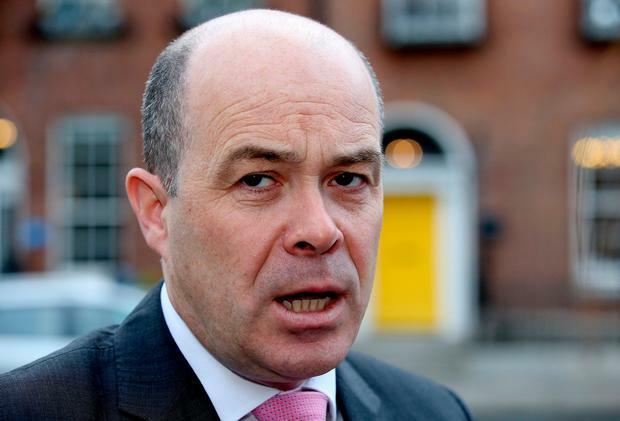 Minister Naughten is under massive pressure over his contacts with the head of the bidding team for the National Broadband Plan (NBP) contract. The Taoiseach was yesterday forced to defend Mr Naughten's New York dinner with US businessman David McCourt in July amid claims that the tendering process is now "contaminated". It also emerged that Mr Naughten arranged for Mr McCourt and one of his family members to enjoy a birthday lunch in the members' restaurant in Leinster House in April. Mr McCourt's firm, Granahan McCourt, leads a consortium which is the sole remaining bidder for a State broadband contract valued at hundreds of millions of euro. A number of other bidders have pulled out. Speaking this morning on Virgin Media One's Ireland AM, the Taoiseach said he met the minister last night to go through the issues. He said he is "fully" confident in the minister's position. "I asked the kind of questions you're asking me now and he came back to me with answers," Mr Varadkar said. Questioning the Taoiseach, presenter Mark Cagney asked; "And you're satisfied?" Taoiseach Varadkar replied; "So far, yes." Speaking earlier in the programme, the Taoiseach said it is a priority to "get the contract signed". "There needs to be a government scheme to get people connected," he said. "This may be as big as rural electrification back in the day. "We want to keep the broadband plan on track, we want to get it signed." However, Mr Varadkar said the process "needs to be a robust one". When asked if the deal will be "completely insulated" against future court challenges, he replied; "It is always possible it can be challenged, you can't stop anyone challenging it." The broadband row broke out yesterday during Leader's Questions when Fianna Fáil TD Timmy Dooley said the tendering process is "mired in controversy" and Independent TD Thomas Pringle said it was "crazy" for Mr Naughten to meet Mr McCourt while it was ongoing. Mr Naughten said it's his department, not him, that's responsible for evaluating the broadband tender and insisted the process is "by no way compromised by my attendance at a dinner". Mr Dooley asked Mr Naughten if he had lunch with Mr McCourt in Leinster House on April 18. He pointed out that this was the same day Mr Naughten was facing Dáil questions about claims he had an inappropriate role in the Independent News & Media bid to takeover Celtic Media Group - allegations the minister rejects. Mr Naughten said he didn't attend the lunch, that the booking was made under his name, but he didn't speak to Mr McCourt that day or in following days. The minister's spokesperson confirmed that the €37 bill for the lunch was settled from Mr Naughten's salary through the Oireachtas payments system. Fianna Fáil's Micheál Martin claimed that the New York dinner had effectively "contaminated" the broadband bidding process. Mr Martin said Mr Naughten should have been "insulated" from the tendering process as it appeared the bidder was trying to gain advantage. He asked Mr Varadkar if he accepted Mr Naughten should not have met Mr McCourt. Mr Varadkar insisted that Mr Naughten has no role in deciding the tender and said: "I think it's ok for Mr Naughten to have met Mr McCourt provided it conferred no advantage on him." He went on to argue the minister met the heads of many companies, including various semi-state firms, about whom he was later to make a decision on funding. Mr Naughten echoed this, saying he regularly meets communication firm bosses. Later, the senior official in the Department of Communications responsible for the tender process, Ciarán Ó hÓbáin, insisted that the discussion at the New York dinner "had no bearing on the procurement process". Mr Naughten confirmed there was also a separate, formal meeting involving him, the bidders, and departmental officials in June.